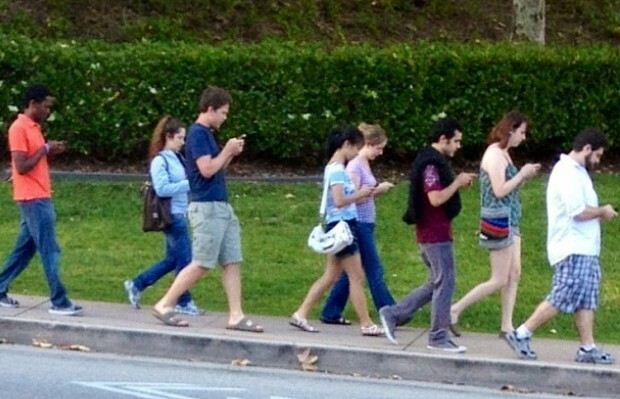 On a beautiful spring day like today, it absolutely amazes me that people are walking around the streets of my city looking down at their cell phones. They just missed a magnificent Bradford pear tree in full bloom and the sounds of happy birds singing their Spring song. They missed a cute black lab puppy full of energy and curiosity, and the sight of the sun trying to poke through a few ominous rainclouds. For the love of all things Holy, put those blasted devices in your pockets and take a look at the world around you! You’re missing a bright, beautiful world full of hidden secrets and delights. It’s the kind of stuff that can actually recharge your Spirit instead of it being drained by small, impossible-to-read, screens. Smell the slight dampness of the air this morning. Feel the shifting pavement under your feet. Be daring enough to smile at someone who passes by you on the street. There’s a wonderful world out there if you only have ears to hear and eyes to see it. The reason why I share my rant and rave with you today, is that I used to be one of those people. Then, one day, I realized I was nature-starved. I also realized I spent way too much time on the computer instead of interacting with people face-to-face. These days I’m practicing what my Buddhist friends call “mindfulness.” I’m sure there’s a Christian and Pagan equivalent to this Holy practice but the Buddhists do it the best, so I take my cues from them! Now, instead of multi-tasking, I give my full attention to one thing at a time. When I take my dog to the dog park, I keep my cell phone in my pocket and spend my time talking to other dog owners and interacting with the dogs. I also watch all the subtle changes in the natural world that surrounds the park. When I sit down to eat a meal, I try to enjoy the food I’m eating and pay attention to how it smells, tastes and even feels in my mouth. I also say a prayer of gratitude that I am the recipient of the meal that is before me. I think you get my point. If you’re feeling a bit drained and frazzled these days, I encourage you to connect more deeply with the natural world. In getting in touch with nature, I believe we become closer to the Divine. When we engage in deeper conversations with those around us, it changes our energy as well as theirs. Speaking of which…why are you reading this? Yes, I’m glad and grateful you’re interested…but I think I’d rather have you disengage from your computer/iPad/cell phone and walk into the bright, beautiful world our Creator has made for our enjoyment. Blessed be! This entry was posted in Creation Spirituality, Spirituality and tagged Christian, Pagan, Spirituality, Wicca. Bookmark the permalink.